The weather continued to be nasty last week and made this year’s Yayoi festival in Nikko an almost unbearable experience. It was cold. And rainy. And cold. And ridiculously windy. And snowy. And everything nasty. And on the rare occasions when it was sunny, it was bitterly cold. Festival goers wrapped in blankets, it's cold! Dr Trouble (who’s a total matsuri otaku) was kind enough to prepare this short bit of Yayoi info for your reading pleasure. Nikko Futaara Shrine (日光二荒山神社) Reitai-sai (例大祭) Yayoi-sai (=Yayoi Festival 弥生祭) information is provided in English by the Nikko city tourist office here. Please check it out. Below we give you supplementary information about this festival and hopefully, together with the official version on the Nikko city tourist office site, it will all start making sense. In the late 8th century monk Shodo (priest Shoto? - according to the description on the Nikko city website; 勝道上人) developed Nikko as a sacred training ground for Buddhist monks and Shinto priests (there was not much distinction between these two religions back then). Futaara shrine now represents the entire Futaara shrine complex – there’s much more to Futaara than just the main Futaara building. The ritual ceremonies of the first four days (from April 13 to 16) of the Yayoi festival are connected with Futaara shrine. During the last two days (April 16 and 17), along with mikoshi (神輿) that belongs to Futaara shrine, you also encounter yatai (家台: in other parts of Japan also called dashi - 山車), owned and decorated by Nikko city locals from each of the 13 city districts. Unlike mikoshi, which has to be carried, yatai has four wheels which makes parading from shrine to shrine and around town a lot easier. Why? Yatai in Nikko can turn by themselves (unlike the floats in Moka). It looks like these three shrines, Honsya (本社, a building behind Haiden Oratory 拝殿), Honguu (本宮), and Takinoo shrine (滝尾神社) in Futaara all have their own mikoshi. 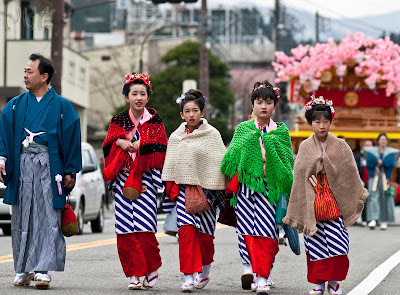 In this festival, the three shrines of Futaara get their mikoshi all snazzed up and take them out for a walk, with Shinto priests dressed up in ritual outfits doing the heavy lifting and carrying bit. Nikko city districts have their own yatai and the natives - all dolled up in fancy festival “cosplay” attire, take the yatai out for a spin. During the first four days of Yayoi you can see mikoshi (owned by the three sub-shrines) being carried back and forth around the complex. They stop by at Tosho-gu (東照宮) to say “hi” to their neighbors when passing by the front gate of Tosho-gu. That is where and when the staff of Tosho-gu offers numerous items to the Futaara mikoshi in accordance with traditional formulas in ritual ceremonies. At Sakamukae shiki (酒迎式) on April 16th, rice, sake (Japanese wine), veggies are also donated by Tosho-gu priests (東照宮神職) to the front row of mikoshi at the main gate of Tosho-gu (is Ieyasu Tokugawa watching the ceremony?). Traditional performances - ohayashi (= traditional orchestra お囃子), hounou-yokyo (奉納余興), nihon-buyoh (traditional dancing日本舞踊), minyoh (traditional singing 民謡), welcome you at any occasion during the last two days. But not today, because the weather was yucky. The official site says that every single process of the ceremony has to be in law and order, or you will be in trouble. Note that another name of this festival is Gota matsuri (ごた祭り). Gota means “trouble” in the local, ancient dialect. Just like the name of our blog. This year the weather was “gota”. Very “gota”. PS. You can see more Yayoi photos here and here and here on our other blog - Tochigi Daily Photo.